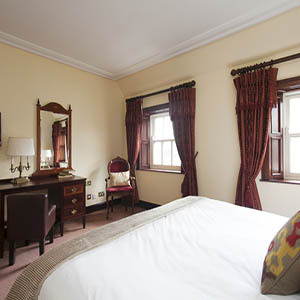 The Mont Clare Hotel is a traditional home-from-home style hotel, a Dublin City Hotel, as well as a local landmark and popular meeting place among Dubliners and visitors alike. The 3 star O'Callaghan Mont Clare hotel is located in the heart of historical Dublin where Government buildings and Museums were built on Georgian Squares, filled with restaurants, businesses and residences that combine to create pour cities unique character and bustle in Merrion Street Lower, Dublin 2, Ireland. 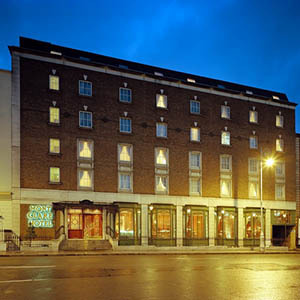 The hotel offers a choice of budget accommodation in Dublin city centre. Its 66 bedrooms are traditionally decorated, some of the rooms overlook Dublin's Merrion Square where you may be able to catch a glimpse of Oscar Wilde's statue languishing in the corner of the square. The 3 star Mont Clare hotel in Dublin 2, boasts amazing Goldsmith's restaurant with its traditional wood panelled walls overlooking Merrion Square where a buffet Irish breakfast is served, the place can accommodate up to 100 guests. One of the most popular destinations amongst Dubliners and visitors alike is Oscar's Bar & Kitchen in this hotel. It offers great food and drinks in its relaxed atmostphere. It is a great location for every occassion, whether you want to chill out with friends or enjoy a family birthday. The hotel offers live music every Friday and Saturday from 8pm - 10pm, also there are great deals of music around and Temple Bar is a 10-minute walk away. The Hotel is located only a short journey away from live music venues: the 3 Arena, Bord Gais Energy Theatre, Gate Theatre, and Abbey theatre and many more. There are great deals of sport events telvised and guests can enjoy watching a sport action on the TV, attending to the capital's great sport venues such as Aviva Stadium or Croke Park is not a problem from this hotel as they are just a few minutes away. This hotel is one of the perfect Dublin venues for events, conferences, meetings, product launch and function, it is close to transport links from every part of the country, by LUAS, coach, train, DART or by car and the Aircoach stops beside the hotel so delegates flying in to the city have a direct link to Dublin airport.